Currant (Ribes spp. ): growing, planting, caring. Currant is as easy to grow as it is delicious to eat! Given its price in the super market, it would be a pity not to plant any! Scientific name : Ribes spp. A fruit bush with slightly prickly stems, cousin to brambles and blackberries, with brownish-reddish wood and tender green foliage. Depending on the type, the fruit can take on a variety of colors when mature. Currant is a member of the Ribes genus and the Grossulariaceae family, producing berries that are loved by all kinds of birds...and people too! You can plant shoots with bare roots from October to March, and you have until May for pre-potted plants. Avoid freezing periods as much as possible. Currants like to have full, indirect, sunlight. They may eventually be planted in partial shade, especially if they're shelted by a wall that will keep them warm. They prefer rich soil, and they'll pay you back in rich fruit! Remember to weed thoroughly before planting to avoid any risk of competition, especially with invasive species — what other, less-informed people than you still call "weeds" — to limit infestation and sickness. Plant the green sprouts of the young shoots in a hole 8 - 10cm deep. Ideally, plant in a line oriented from north to south. Allow 1.5 metres of space between each plant, and also count for 1.5 meters between planting holes. Enrich the soil used during planting with compost. Be careful: don't bury the base of the stem, as this will slow the growth of your plant. 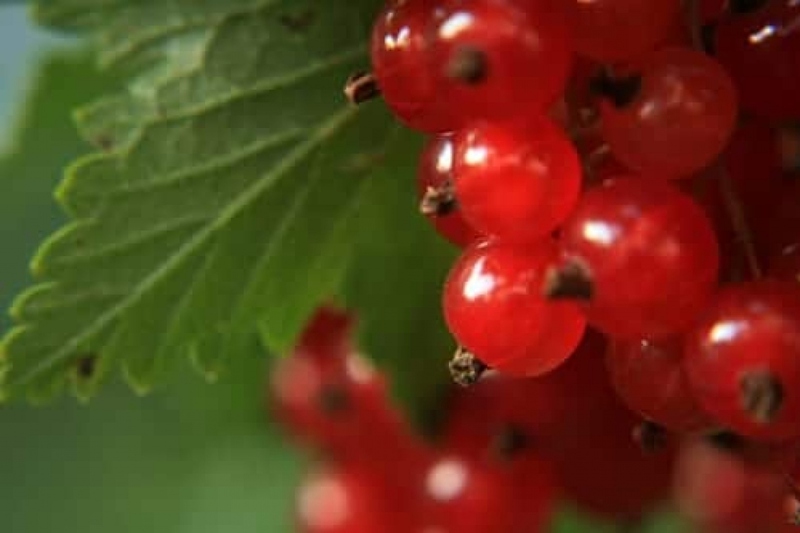 Direct the growth of your currants before they become too large, partially to slow their development, which can turn out to be fairly quick, but also to insure optimum fruit production. If you have a full row of currants — lucky you ! — plant them in a line marked by small stakes, with wire connected to both sides of the stakes at a height between 40 - 80cm. Leave about 60cm of space between each plant. Your currants will grow and stay contained between the wires — nice and organized! Keep an eye on the stems and don't think twice about putting a wayward stalk back in line! If you only have one or two plants, you can use stakes to support the stems, but they need to be checked on regularly, even changing the stakes over the course of the season! Eating fruit straight from the tree is hard to resist! The whole question is knowing if you should eat these berries that could still use a bit more sun right now, or if someone will have eaten them before you come back to the garden! Currants are sufficiently resistant to diseases overall. Nevertheless, you might be run into powdery mildew, which appears in felty, white patches on all or part of the plant, especially the leaves. Rust fungus causes orange-brown pustules on the undersides of leaves, and aphids will cause leaves to roll up and lose their original color. Keep an eye out for scale insects too! You may make a stinging nettle fertilizer to cure the effects of powdery mildew — you can even find 100% organic stinging nettle fertilizer in garden stores! Aphids feed primarily on leaves, especially in spring. To fight against aphids, adopt some ladybugs! There are lots of ways to get rid of aphids, so try to avoid the old, harmful method of spraying soapy water on fruit bearing plants.